NEW YORK�(CNNMoney) -- U.S. stocks gave up an early advance and closed little changed Monday as investors looked ahead to corporate reports due throughout the week. 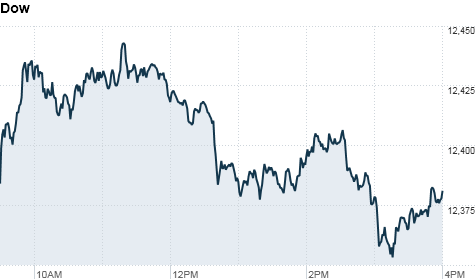 The Dow Jones industrial average (INDU) rose 1 point, or less than 0.1%, to close at 12,381. The S&P 500 (SPX) slipped about 4 points, or 0.3% to 1,324. The Nasdaq Composite (COMP) sank 9 points, or 0.3%, to 2,771. Stocks posted broad-based gains earlier in the session on a spate of deal news and a drop in oil prices following talk of a cease fire in Libya. But the tone turned more cautious in the afternoon, as investors were awaiting the early results of the first-quarter reporting period. After the market closed, Alcoa said it earned 28 cents per share in the first quarter, beating analysts' estimates by a penny. JPMorgan (JPM, Fortune 500), another Dow component, and Google (GOOG, Fortune 500) are also slated to post results later this week. As of last week, earnings for companies in the S&P 500 were expected to be up around 11% versus the first quarter of 2010, according to estimates from Thomson Reuters. Revenues are seen rising 8% in the quarter. "The expectation is that the numbers will not disappoint," said Mark Luschini, chief investment strategist at Janney Montgomery Scott. However, he said investors will be looking for clues on how companies are coping with rising prices for oil and other basic commodities. "I think that will be the real story this quarter," Luschini said. In addition, the 3% pullback in oil prices weighed on shares of energy producers and industrial companies. Alcoa (AA, Fortune 500) and Caterpillar (CAT, Fortune 500) dragged on the Dow, while Exxon Mobil (XOM, Fortune 500) and Chevron (CVX, Fortune 500) were also weak. "Oil sold off and the market is taking its cues from that," said Tom Schrader, a managing director at Stifel Nicolaus. Investors also looked past comments from Janet Yellen, vice chairman of the Federal Reserve, who suggested that the central bank will remain accommodative for some time. "That normally would have supported the market," said Schrader. "But it doesn't seem to be having any impact." After a strong start to the year, trading could be choppy in the weeks ahead as stocks hover near their highest levels in over two years, said Steven Goldman, market strategist at Weeden & Co.
"The general feeling is that stocks are still priced to go higher," he said. "But a lot of people have already committed, which makes it more difficult to have a sharp advance." Companies: Endo Pharmaceuticals (ENDP) announced plans to buy American Medical Systems (AMMD) for $2.9 billion in cash and stock. Shares of American Medical jumped 32%, while Endo stock rose 5%. Communications services company Level 3 (LVLT) announced plans to buy rival Global Crossing (GLBC) in an all-stock deal valued at $3 billion. Shares of Tyco (TYC) were up 3.5%, amid speculation that France's Schneider Electric is considering a bid for the Swiss industrial conglomerate. On the down side, shares of Tenet Healthcare (THC, Fortune 500) sank 15% as the company filed suit against Community Health Systems, which is pursuing a hostile takeover bid for Tenet. Shares of major U.S. automakers Ford and GM were also under pressure. Ford (F, Fortune 500) fell 3%, while GM (GM) was down 2.8%. NYSE Euronext, the parent company of the New York Stock Exchange, said Sunday that its board rejected a takeover offer from the owner of Nasdaq and another rival exchange. Economy: Late Friday, lawmakers pushed through a last-minute budget bill to keep the federal government open for business. Uncertainty about a possible shutdown kept investors on edge last week, sending stocks down on Friday. While investors may welcome the deal -- because it creates more certainty about this year's government spending -- lawmakers will now refocus on even more difficult budget battles ahead. Questions still loom about raising the debt ceiling and dealing with long-term deficits in the 2012 budget. World markets: London's FTSE ended flat, while the Dax in Frankfurt eased 0.2% and Paris' CAC-40 fell 0.6%, after an earthquake shook northeastern Japan -- sending a landslide into Iwaki City. That's the same region that was devastated by a deadly earthquake-tsunami on March 11. Over the weekend, the Chinese government reported its first quarterly deficit in seven years, as imports outweighed exports by more than $1 billion. That's a stark contrast to the first quarter of 2010, when China's General Administration of Customs reported a surplus of more than $13 billion. Asian markets had already closed in the red prior to Monday's earthquake. Currencies and commodities: The dollar rose against the euro and the British pound, but fell versus the Japanese yen. Oil for May delivery slipped $3.62 to $109.19 a barrel. Gold futures for June delivery fell $6.10 to $1,467.80 an ounce. Earlier in the session, the precious metal hit an intraday high of $1,478 an ounce. Bonds: The price on the benchmark 10-year U.S. Treasury was little changed, with the yield unchanged from Friday at 3.57%.